Gentlemen, we can rebuild him... We HAVE the technology! That was the promise made, week after week, during the opening titles of the hit 1970s television show The Six Million Dollar Man. 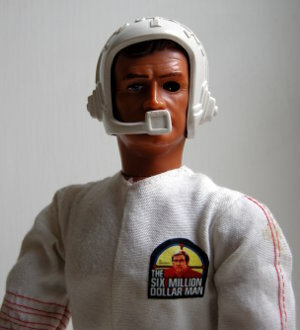 It made total sense, therefore, when Kenner and General Mills acquired the toy license to manufacture the action figure spin-off merchandise in 1975, that kids should also be given the chance to rebuild their own 13-inch version of Steve Austin, the Bionic Man. 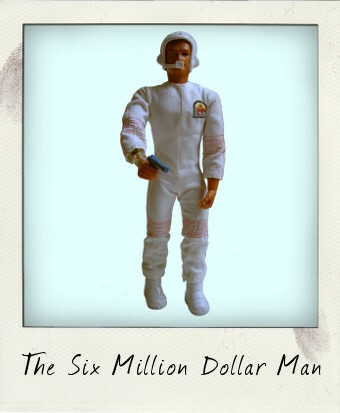 The decision to make the Six Million Dollar Man action figure so interactive, issuing him with interchangeable “Critical Assignment” arms and legs, a bionic eye you could actually look through, not to mention an accompanying universe of playsets and gadgets, was an inspired one – the action figure is as popular with collectors today as it was with children at the time, and like the show itself, is a cult classic. The Six Million Dollar Man figure was released in three basic versions, but with a little careful study of your figure it should be quite clear which of the three you have. The first issue was packaged with an engine block and a removable right arm only, whilst with the second issue both arms were removable. The third issue figure is recognisable via his bendy "bionic grip" fingers and a steel beam accessory instead of the engine block. Our Steve here is a first issue figure, although the Six Million Dollar Man is probably most recognisable in his NASA-style red jumpsuit – what you see here folks are his space suit and boots from the Mission to Mars outfit, matched up with another accessory, the headset from the Backpack Radio set. His right arm is actually the Oxygen Supply Arm from the Critical Assignment Arms set. Issued with an oxygen mask which was accessible via a red door in his bicep, when I checked this figure instead of the mask I found a blue weapon – the Sonic Neutralizer Gun from the Neutralizer Arm! The kid who owned this figure back in the day clearly had LOTS of fun and many accessories too! 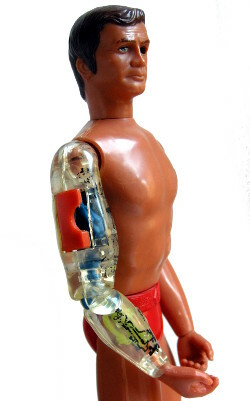 All figures were issued with the famous roll-back skin on the bionic arms which would reveal his interchangeable and removable bionic bits and pieces – finding a figure where this rubber has survived nearly forty years in mint condition, however, is nigh on impossible! What has survived beautifully – kudos to Kenner here – is the ratchet action lifting feature designed to lift the steel beam or engine block accessories. If you turn his head to the right and press the red button on his back, his bionic right arm will still rise, whilst turning the head back to the left will release the action (check out the video). 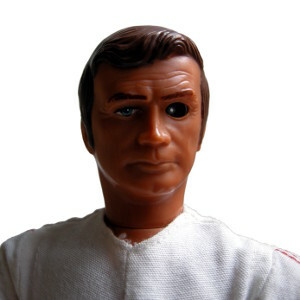 Kenner's crowning achievement, of course, was the fact that this figure actually resembled the star of the show Lee Majors, capturing his dimpled chin, blue eyes - or rather EYE - and chiselled features perfectly. Even the lines on his forehead have been faithfully reproduced. Sheer vintage action figure perfection and an absolute must-have item in any vintage action figure collection! WOW!You truly have a classic!